Regenerative medicine can grow entire organs out of stem cells. If things follow what researchers wish them to, one day pluripotent cells should also replace cardiac pacemakers. The cycle-rate can be individually regulated by light pulses. The technology sits directly on the heart and can save lives. The pacemaker tells the blood pump at which speed it must operate, but it can’t, in terms of lifetime and quality, match the natural pacemaker. After a few years, the battery is finished. Its constant movement also tears at the wires, so that fatigue sometimes causes a malfunction or even leads to failure. Would it not be nice if it were possible to replace the electronics in the metal box with biological regulators? The path there could be one paved with stem cells. Previous studies involving repair to injured heart muscle had not been very promising. 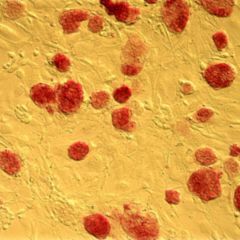 The stem cells which were used disrupted the timing of the remaining cardiocytes. 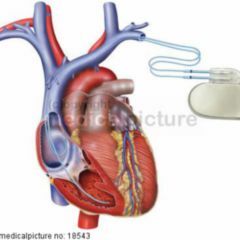 The proposal that stem cell technology however could in the long term bring about an entirely new kind of pacemaker is something on which results from the Stanford University allows us to pin our hopes. A team of system biologists, engineers and physicians based there have succeeded in making a molecular pulse generator for the heart out of embryonic stem cells which can be controlled from the outside. The results were published last Autumn in the prestigious Biophysical Journal. Karl Deisseroth’s laboratory is occupied with the medical application of optogenetic methods applied to nerve cells. Using light pulses, the scientists activate manipulated neurons and are then able to continue to keep track of the signal on its path. Employing genetic engineering, collaborator Oscar Abileez has succeeded in making embryonic stem cells sensitive to light. For this purpose he inserted channelrhodopsin-2 into the membrane of stem cells. This sodium-ion channel originated from green algae and blue light can be used to stimulate and open it. Via targeted differentiation, cardiac muscle cells were formed out of stem cells. Blue light pulses of 480 nm ultimately transformed the cells in the culture dish into cellular potential generators. Using patch-clamp technique the bioengineers recorded the strength of the stimulus, video microscopy made it possible to define the frequency of the pulsating muscle. The cells beat in corresponding rhythm with the predetermined time sequence of light pulses. Can this simple in-vitro model be applied to the human heart? In order to answer this question, Abilez went to the nearby laboratory of Ellen Kuhl. She is working on a computer model of the human body. Using the experimental data of its stem cells, a biological human heart pacemaker is able to be simulated on a computer at least. The virtual model showed how different placements of the stem cells in the heart have an effect on the transmission of signals and thus an impact on the optimal pacemaker position. A cellular pacemaker driven by light signals – such an experiment was announced by scientists from San Francisco, Freiburg and Dresden already half a year ago in Science. Here they used the zebrafish heart muscle cells, which possess both a power switch (channelrhdopsin-2) and an on-off switch in the form of halorhodopsin. Halorhodopsin is a (yellow) light-driven ion pump that transports negatively charged chloride ions into the cell and thereby extinguishes existing electronic currents of charge. With the combination of the two membrane proteins, and blue or yellow light, Aristides Arrenberg and his colleagues reset tachycardia, bradycardia or adjusted cardiac standstill in the fish heart. In a future biological pacemaker, the developers have in mind that the implanted cells be able to attune via light signals to the rhythm of the native pace maker already present. The light source might be able to lie in another body region or even outside it altogether and its signal conducted via fiber optics on to the implanted pacemaker cells. With autologous stem cell grafts, rejection or intolerance would no longer be an issue. The synchronised beating cells ideally would quickly become part of the natural heart muscle. In 2010, Nature chose optogenetics as “Method of the Year”. Already ten years ago German researchers Ernst Bamberg, Georg Nagel and Peter Hegemann discovered the first light-sensitive ion channel protein. Three years later, the era of optogenetics began when Alexander Gottschalk of the University of Frankfurt inserted the gene into roundworms. Light pulses brought the cells to emit signals. Especially in the area of the nervous system quite a bit has since been done: female flies caught in a blue light start to perform courtship, mice wake up gently from a deep sleep or lose their natural fear, depending on where the relevant neurons are made active. Targeted molecular light switches can however be used in other systems. In October last year DocCheck reported on the production of peptide hormone GLP-1, an important element in insulin metabolism in renal cells. Perhaps metallic generators used as heartbeat-support will in one or two decades already belong to the past. Instead, a rhythmic blue light will illuminate a colony of implanted cardiac muscle cells, that will transmit their signals to the neighborhood: all wirelessly and with easily individualised controllability.